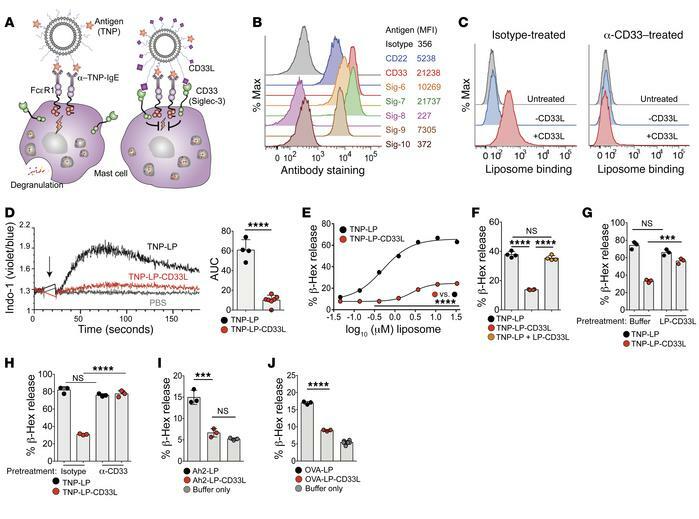 Display of CD33L on antigenic liposomes suppresses IgE-dependent degranulation of LAD2 cells. (A) Schematic representation of an antigenic liposome (TNP-LP, left) or an antigenic liposome displaying human CD33 ligands (TNP-LP-CD33L, right). (B) Antibody staining of various Siglecs (Sig-) on LAD2 cells analyzed by flow cytometry. (C) Flow cytometric analysis of binding of fluorescent liposomes with or without CD33L (20 μM) to LAD2 cells pretreated with isotype control or anti-CD33 (clone WM53). (D) Calcium flux of LAD2 cells induced by addition (arrow) of TNP-LP or TNP-LP-CD33 (2.5 μM) or PBS (1 μl). Graph shows quantification of the AUC of calcium flux induced by 2.5 μM TNP-LP or TNP-LP-CD33L. Results were combined from 2 independent experiments. (E) Degranulation induced by TNP-LP or TNP-LP-CD33L as measured by the percentage of β-hex release (n = 3 per condition; values are plotted as the mean ± SD). (F) Degranulation induced by TNP-LP (30 μM), TNP-LP-CD33L (30 μM), or a mixture of TNP-LP and LP-CD33L (30 μM each). (G) Degranulation induced by TNP-LP or TNP-LP-CD33L (30 μM) in the presence of LP-CD33L (10 μM). Control cells received buffer only. (H) Degranulation induced by TNP-LP or TNP-LP-CD33L (30 μM) in the presence of isotype or anti-CD33 (clone WM53, 1 μg/ml). (I) Degranulation induced by Ah2-LP or Ah2-LP-CD33L (30 μM), with final Ah2 at 750 ng/ml using LAD2 cells sensitized with atopic plasma reactive to peanut (PlasmaLab). (J) Degranulation induced by OVA-LP or OVA-LP-CD33L (30 μM), with the final OVA dose at 1.5 μg/ml using LAD2 cells sensitized with human anti–OVA-IgE. Results in E–J are representative of 3 independent experiments. ***P < 0.001 and ****P < 0.0001, by 2-tailed Student’s t test (D and E) and 1-way ANOVA followed by Tukey’s test (F–J). α, anti; Max, maximum.